Discussion About Administration of Fortinet Devices with Specific technical solutions as well. During a recent redesign of a large Fortigate deployment I needed to be able to import large numbers of IP address objects into the new build. Simply copying the configuration to the new box was out of the question as there were just as many Objects buried in the configuration that were not wanted/needed in the new build. I had a spreadsheet developed listing everything I needed so I built this simple PowerShell script that will write a config that can be pasted into the Fortigate CLI. It builds the Objects, and imports a comment for each to add clarity down the road, when an administrator needs to know what an object is for. It also provides the option to create an address group and apply all of the objects to that group, and again a Comment is created on the group object as well. This script can save a large amount of time on a rebuild, or new Fortigate deployment. It is also a great help if you just want to add a bunch of Objects and group them, and do things consistently and quickly. Do you want to create a group for these Objects, If yes it asks for a group name and comment. The Script Builds the configuration and dumps it to a text file. It will then ask if you would like to open it in notepad. Currently the script only creates Subnet Objects, however I am looking to build the capability of it checking the address and if it looks like a FQDN it would create and FQDN object instead. # for these new adddress objects. # Usage: Answer-YesNo "Question Text" "Title Text"
$UseVDOMs = Answer-YesNo "Does The Fortigate Configured with VDOMs?" "VDOM Configuration"
$VDOMName = Read-Host "Please Enter VDOM Name (! !Case Sensitive!! 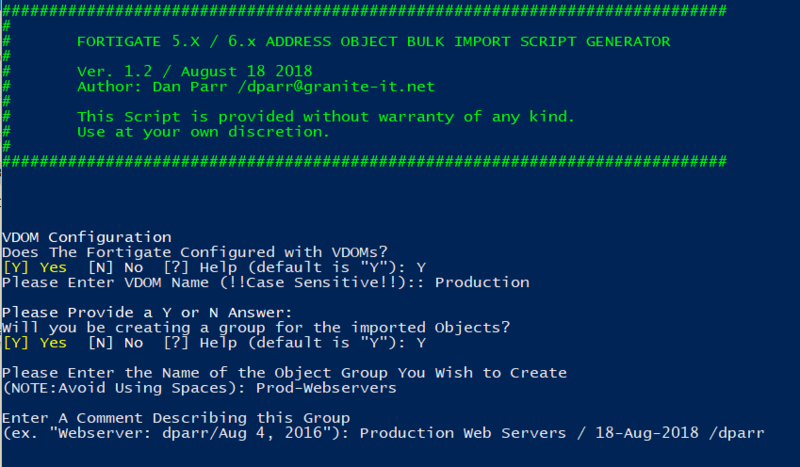 ):"
$MakeGroup = Answer-YesNo "Will you be creating a group for the imported Objects?" "Please Provide a Y or N Answer:"
$GroupName = Read-Host -Prompt "
$GroupComment = Read-Host -Prompt "
(ex. `"Webserver: dparr/Aug 4, 2016`")"